Find out 7 Simple and Easy Way to Fix, Remove or Format Write-Protection Error of USB Flash Drive and Make it Re-usable Again. Summary: USB flash drive or external memory stick or pen drive is write-protected and refuses to format and display the error message “The disk is write protected. Remove the write protection or use another disk.” So, in this post you can try different solutions to fix “write protected” error of USB drive. But do remember to follow the solution one-by-one and check your problem is solved or not. But, before you follow the below-mentioned solutions, you must recover files from write-protected USB drive using Photo Recovery Tool. Restore digital media files such as photos, videos and audio files from write-protected USB flash drive. Also retrieve media files from locked, unrecognized, read-only USB drive. 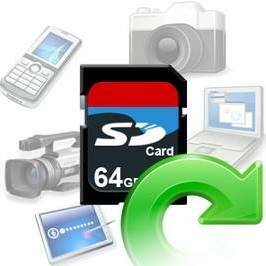 Recover files from write protected SD card, memory stick, pen drive, external hard drive. Alright, so now let us begin with the user example. HOW TO REMOVE WRITE PROTECTION FROM USB FLASH-DRIVE??? i have problem with my SANDISK,USB FLASH-DRIVE(8GB) that whenever i insert or plug it with some computer and try to write(CUT,COPY etc) it shows an error that THE DISK IS WRITE PROTECTED..can any one please suggest that why it is displaying such error…at first i think that this is problem with my pc but know the essue is same for all computer..
can any help me to resolve this issue??? After getting the above error message, you will not be able to copy, cut or move files from your USB drive. As well as you will not be able to use your write-protected USB drive, until and unless you fix it. Fortunately, we have got some simple but very effective solutions and steps that will solve USB drive write protection problem. Additional Reading: Recover Files From USB Drive Without Formatting It? Some USB flash drives have mechanical switch on their body that puts them into “Write-Protected” mode. Hence, check if there is any small slider switch that may have got stuck in your pocket or computer case. If this is the case, then simply slide the switch into unlock position and check problem is solved or not. Each and every time when you plug USB drive to your PC, you must automatically scan it for virus. Because, virus is dangerous and it can fill your USB with unwanted/unknown files and this can cause USB drive to display write-protected error. According to your antivirus software, you can configure it to automatically scan a USB drive when connected to computer. If not, then you can manually scan it. Simply, ‘right-click’ and force a manual scan. If it detects any virus, then eliminate it. After this, you can check your USB drive and I hope you will not get write-protection error. Sometimes your USB drive may throw write protect error, if it is full. Go to My Computer/PC. This provides you an overview of all drives connected to your PC. 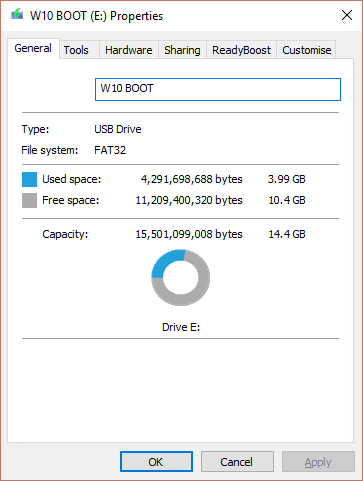 Now, right-click your USB drive and select Properties, this will show the current drive capacity – both used and free space. If in case, your USB drive is full then move some files to another drive and delete them from the USB drive to make enough space. There are cases, in which we have found that a single file that is marked as “read-only” refuse to get deleted from the USB and this can throw several error message and one of them could be Write-protection error. Nevertheless, you can fix “read-only” error of USB drive. 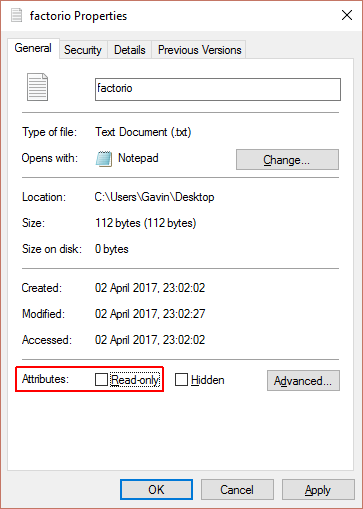 To fix this, open your USB drive look for the read-only file. Right-click on the file and select Properties. At the bottom of the panel, you can see the Attributes option – here make sure that Read-Only is unchecked. 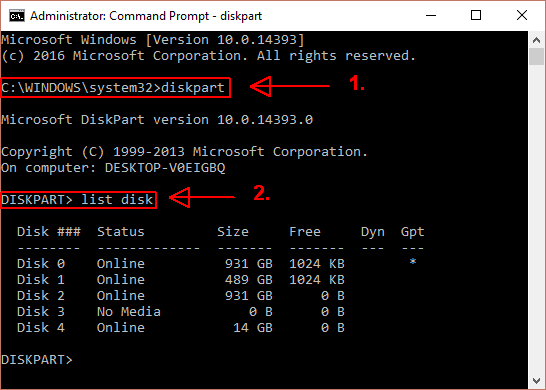 Whether you are familiar or unfamiliar with Command Prompt, you can follow these steps to fix write protection of USB. Well, you do need to get worried about it because it is really isn’t scary as it sounds. Connect your USB drive showing as “Write Protected” error with PC. Now in command Window type: diskpart and hit ENTER. Next type: list disk and press ENTER. You will see the list of mounted disks. Once, you received the Disk attributes cleared successfully. Type: exit and press ENTER to finish the process. That’s All! You have cleared any remaining read-only file attributes from the USB drive. Important Note: Before following the below solution, you must first backup all the files and data from your USB drive to your PC. Because formatting the USB will erase entire data stored within it. But, if in case you forgot to keep the backup of the files of your USB drive, then you can use USB Drive Data Recovery software. 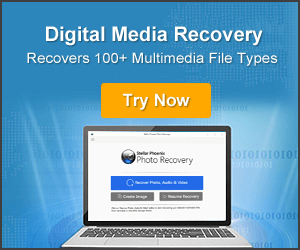 And one of the popular USB file recovery tool is Photo Recovery as I mentioned in the beginning of the post. This software will help to retrieve files (photos, videos & audio) from write protected USB drives. Below, you can free download USB Drive Data Recovery Tool. 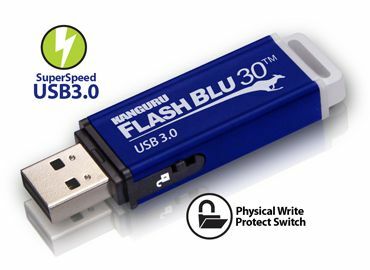 All right, let us come back to the topic – how to format write-protected USB flash drive. But before formatting the drive, you must first check what kind of file system it has – FAT32 or NTFS. To check file system, go to My Computer/PC. Right-click on your USB drive and select Properties. Now, close the Properties window, and again right-click on USB drive and select “Format” option. You will see various customizable option. Give any memorable name to the Volume label, uncheck the Quick Format option and finally click on “Start”. Depending on the size and capacity of the drive, the formatting will take some time. The larger the drive, the longer you have to wait. If there is no physical problem with USB then your USB drive will be formatted, cleaned and ready to use again. 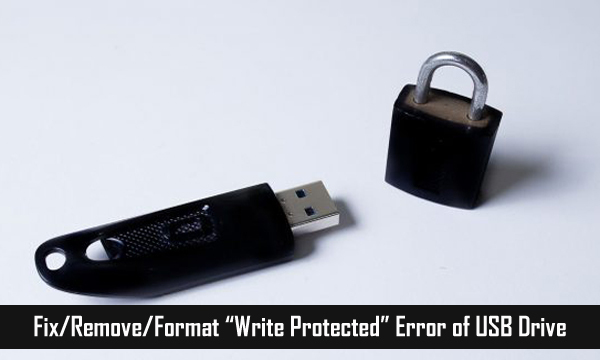 If above format step does not work in your case, then here is another solution that you can use to format and remove write protection error from USB flash drive. Click Start, type Regedit in the search box, click Regedit.exe and click “Yes” to open the Registry editor. Now, look for a key named WriteProtect. If it exists, double-click it. This will open the Edit DWORD (32-bit) Value box. You can now set one of two values: 0 or 1. But here you have to remove the write-protection from the USB drive. 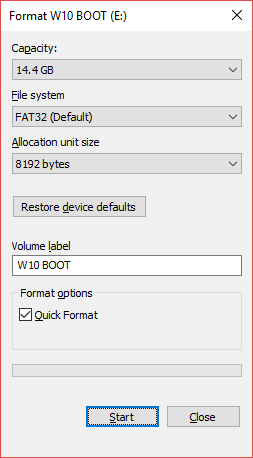 So you should set the value to 0 and press OK.
After that, you can now format the drive normally by right-clicking on it in My Computer and choosing Format as mentioned in above solution no 6. After this, I am sure “The disk is write protected. Remove the write protection or use another disk.” error message will no longer pop up. If your SD card is displaying write protected error message, then you can follow all the above mentioned solution to fix write-protection of SD card – as all the listed solution works with SD card, too. But do remember that like USB drive comes with mechanical write protection switch, similarly SD card also comes with write-protection switch. Hence, check your SD card lock switch before you start to panic. Sometimes, the USB drive errors are simple but sometimes it is difficult. Hopefully, we found few solutions, in both cases. And I am sure you have got something here to learn in this article that would have helped you to fix or remove USB drive write-protection error. 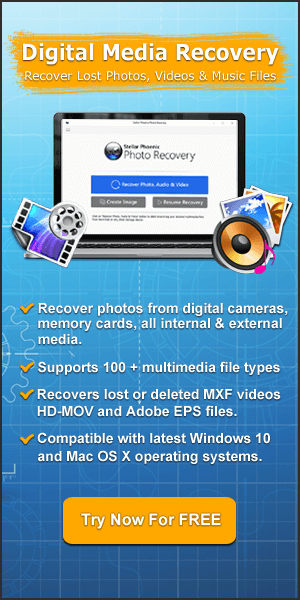 Also, do not forget to apply Photo recovery tool, if you have lost any images, videos or audio files from your write-protected USB drives.